As Spain’s third largest city, the beautiful Mediterranean city of Valencia has so much to offer. From the medieval old town, to modern museums, to golden sandy beaches, this east coast gem makes for a wonderful holiday destination. From Madrid, the most comfortable and convenient option to get to Valencia is by high-speed train called the AVE. The journey takes about 1.5 hours and 3.5 hours if you go by car. If you’re coming from Barcelona the train rides takes between 3-3.5 hours, or 4-5 hours by bus. 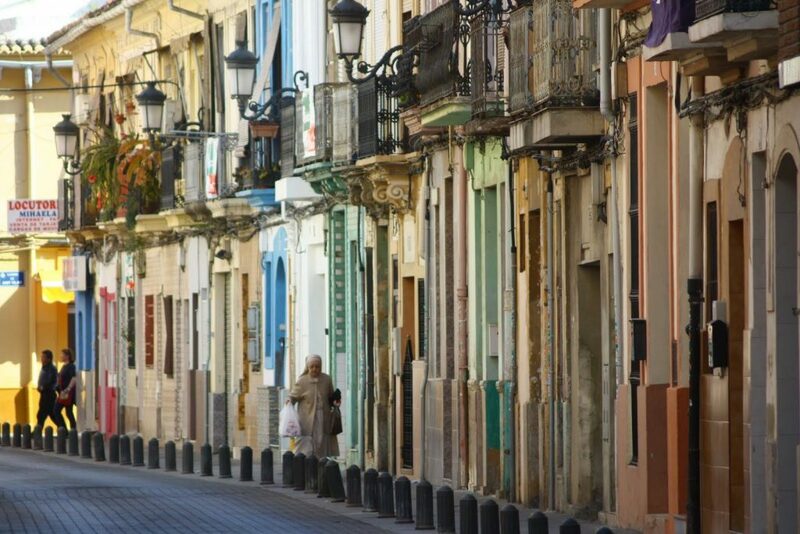 These ancient, historical and streets are best explored by letting yourself get lost. As the most charming neighborhood in Valencia, you’ll be mesmerized by the old architecture and little plazas around every corner, often centered with an olive tree. 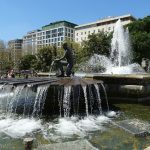 Valencia is a “terrace town,” and you’ll find locals and tourists alike basking in the sunny, Mediterranean climate while enjoying a beverage on a terrace. And don’t forget to keep your eyes open as you meander the streets to what makes Valencia its own, unique place: the urban art. 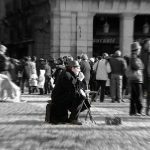 Whether sprayed on the Old Town walls or displayed on the doors of establishments when they’re closed, you’ll be enamored with the creativity that flows through these windy streets. It’s nearly impossible to miss the Torres de Quart and Torres de Serranos (Quart Tower and Serranos Tower), which is the entrance into the old town. These ancient towers are impressive any way you feast your eyes on the gateway, but it’s highly recommended to see them at night when they’re gently lit up. One of the most historical monuments in Valencia is the cathedral, located in Plaza de la Reina, perhaps the city’s loveliest square. Dating back to the 13th century, you’ll find a beautifully woven mix of architectural styles inside of the predominantly Gothic exterior. The cathedral is an art history lover’s paradise, as you’ll find two of Goya’s paintings, as well as the Holy Grail! 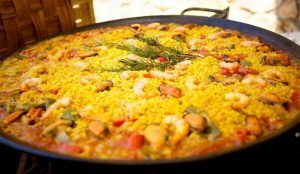 Valencia is famous for paella, a delicious rice dish. If you want to get blacklisted from the city then eat paella for dinner. Don’t do it! Paella is a dish that only Spaniards eat for lunch. If you want to eat where the locals do, head on over to the traditional Yuso, where you’ll feel like you’re at grandma’s house. One thing you must try while you’re in Valencia is horchata, a traditional drink made from tiger nuts and sugar, served over crushed ice. It’s an acquired taste for some, but for those who adapt it’s a delicious indulgence. Head on over to Horchateria de Santa Catalina for the best in town. If horchata isn’t your thing, you can choose another decadent sweet to nurture your craving. 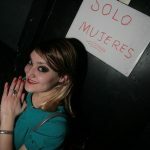 At night, El Carmen comes alive with socialites hitting the streets at about 10 or 11 pm. If you’re not too afraid of dolls and want a new and strange experience, stop at Nou Pernil Dolç for a drink. For something more relaxing on a chilled-out terrace, have a seat at Café Sant Jaume, located on a picturesque corner of El Carmen. SH Ingles Boutique Hotel is an enchanting place to stay if you’re a lover of architecture and want to deeply explore the wonders of the Old Town. Set in an 18th-century palace, the hotel is just a stone’s throw away from the cathedral. Ayre Hotel Astoria Palace is an elegant choice located just 500 meters from the Valencia Nord Train Station. If you want all of the charm and stellar location but something more economically-friendly, we recommend Hotel Ad Hoc Monumental. The lovely Turia Gardens are special for a couple of reasons. 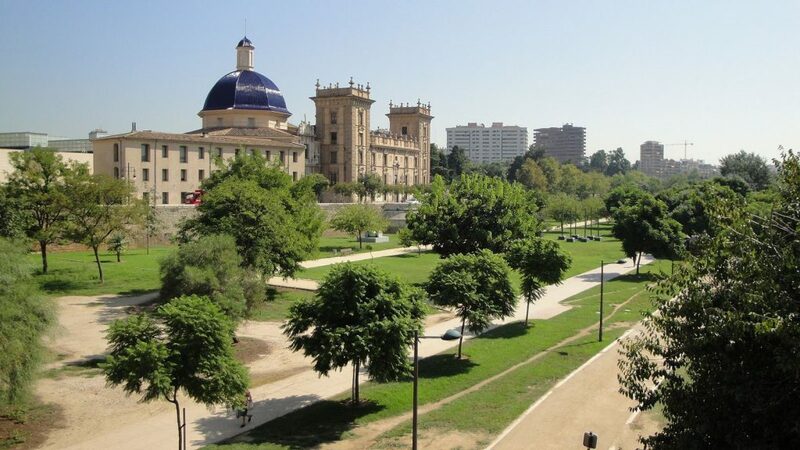 First of all, it’s one of many of Valencia’s glorious green spaces and one of the biggest urban parks in all of Europe, stretching over 9 kilometers. As an old river bed, Turia also has an interesting history. Once upon a time, a wide river divided the city into two sections. In the mid 1950’s, Valencia suffered a terrible storm which overflowed the river and flooded the city. From that day forward, the river was rerouted in order to avoid such a disaster in the future. A delightful park was put in its place. You can stroll this magnificent park, cycle along (you can find bicycles for rent), or jog for those of you who like to keep up with your fitness when you’re on holidays. The park offers paths to accommodate all those who want to appreciate everything the park has to offer. The green landscape brings a large variety of plants and trees, including orange trees. Make sure you sink your teeth into Valencia’s famous oranges. If you want to increase your nature intake, swing by the Botanical Gardens or the famous Royal Gardens , located along the old river bed. Playgrounds are within the park for you families with little ones and you’ll especially want to take them to the peculiar Gulliver ! 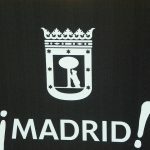 A Cricket Club is also within the park which was founded by some expatriates who’ve decided to make Valencia their home. For a mid-stroll pick-me-up, you can find bars and restaurants along the way. Be sure to look up from time to time, as you pass under the many bridges (19 to be exact!) that are along the 9-kilometer stretch. If you’d like to stay near all this greenery, we recommend a few places. Apartamentos Plaza Picasso is an excellent mid-ranged price hotel with modern decoration. For a bit more luxury and amenities, the grand 14-story Eurostars Rey Don Jaime sits opposite of Túria. Hotel Kramer is a more simple and budget-friendly place to stay, still offering you everything that you need. Declared as an Intangible Cultural Heritage Site by Unesco, the Gothic Llotja de la Seda (Silk Exchange) is a gorgeous civil building that attracts millions of tourists each year. 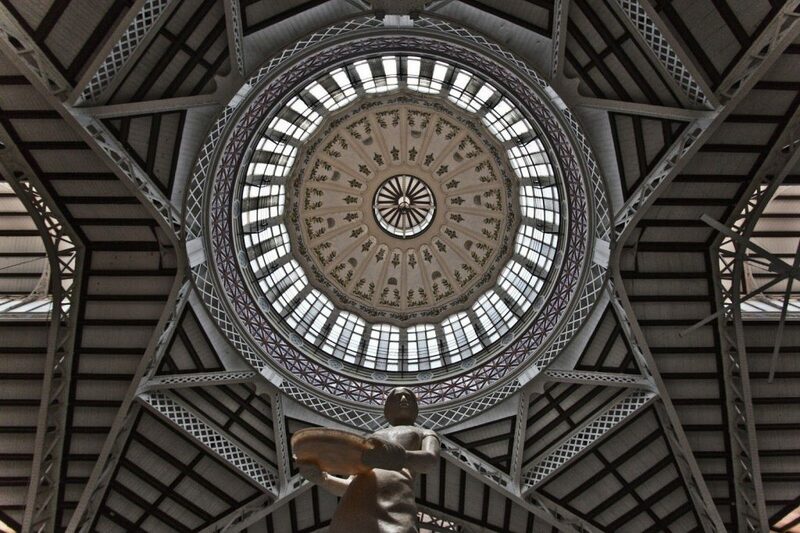 Then give your senses a completely different experience when you go from Gothic to an impressive work of art, which is the 1920’s modernist style of the Central Market , one of the largest indoor markets in Europe. You’ll find some of the freshest and traditional food in Valencia here, with nearly 400 vendors selling their products. Most of the products are local and you’ll see plenty of Valencianos stocking up for their next family meal. The building itself will take your breath away with its ornate design and stained-glass windows. If you like fried seafood be sure to check out the unpretentious Boatella Tapas bar across the way. They get all of their daily fish and seafood from the market, so it’s guaranteed to be a fresh treat! Vegetarians, no need to fret as one of their other specialities is fried artichokes when they’re in season. Santos Juanes Church is just next door and is a beautiful example of the baroque era. 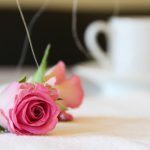 MYR Hotel Plaza Mercado & Spa is a modern, wonderful and reasonably-priced stay if you want to pamper yourself a bit. The Museum is a modern architectural wonder that has been deemed as one of the 12 Treasures of Spain. This cultural and leisure complex will captivate you, even if science has never been your cup of tea. The Hemisferic: IMAX cinema, planetarium, laserium. The Umbracle: a landscaped walkout filled with trees and plants. The Principe Felipe Science Museum: an interactive science museum that includes a skeleton of a whale. NH Valencia Las Artes is a 5-minute walk from all of this cultural stimulation. The hotel has all of the amenities you could ever need, including a gym, sauna and indoor pool. The El Saler Shopping Centre is just across the way. For you beach lovers, you only have to travel 15 minutes from the city center to be swept away the Mediterranean beaches. It must be noted, however, that these beaches become packed during the summer months, especially late July and August. Just south of the port, this wide, golden-sand beach stretches for about 1.2 kilometers and has been awarded a Blue Flag , making it an exceptionally tourist-friendly beach. You can be sure to feel safe with 3 lifeguard towers and 3 medical care stations. The beach is also equipped with amenities, such as showers, toilets, drinking fountains, sun lounger rentals, and even a sailing school. Luxury travelers look no further. Las Arenas Belneario is a 5-star beach resort with world-class service fit for a king and his queen. This elegant beachfront property is just a 2-minute walk to Las Arenas Beach. Brasserie Sorolla is inside of the hotel, offering exquisite taste with a modern touch to the traditional cuisine. Fun fact, the restaurant is named after Joaquin Sorolla, a famous impressionist artist who supposedly was inspired by this magical stretch of sandy beaches. Hotel Neptuno is a charming beachfront boutique hotel that offers a mini spa and overlooks the Valencia harbor. Hotel Boutique Balandret is a trendy boutique-style hotel that has seaside views of the beach and promenade. Next to Las Arenas beach and a 1-minute walk from the Valencia Harbour is the glamorous Hotel Gabbeach. 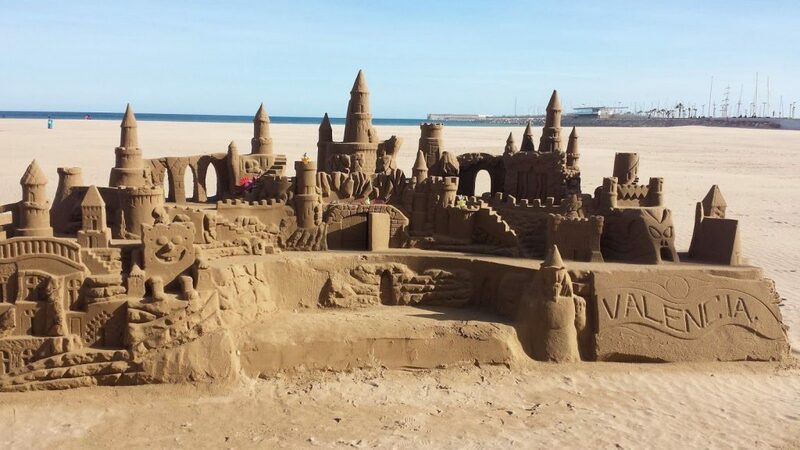 The next beach over is Malvarrosa, Valencia’s liveliest beach. The Maritime Promenade runs along the beach, where you can stroll along taking in the magnificent views. You’ll find many restaurants and cafes along the way. The old fisherman’s quarters line both Malvarrosa and Las Arenas, adding to the charm of this seaside area. Remember that mouth-watering Valencian dish we were talking about called paella? La Pepica has been going strong for more than 120 years and used to be a local favorite of Ernest Hemingway. And he’s not the only famous person who has enjoyed La Pepica’s savory paella. This restaurant has also been visited by Orson Welles and U2. Hotel Miramar is a superb economical boutique – style hotel that offers seaside contemporary rooms. There’s also a fabulous restaurant lounge inside. If you’re looking for a homier feel, the Apartamentos City Beach Valencia is just a 2-minute walk from the beach and located next to a variety of public transport stops. El Coso is a bit more chic boutique-style hotel, displaying a gorgeous mix of colonial and modern style. You’ll find 2 restaurants inside of the hotel so you’ll never need to travel very far. Or also written Cabanyal, is an alluring old fishermen’s quarter that will entice any traveler. Lavished in Art Nouveau architecture, you may question where you are for a moment. 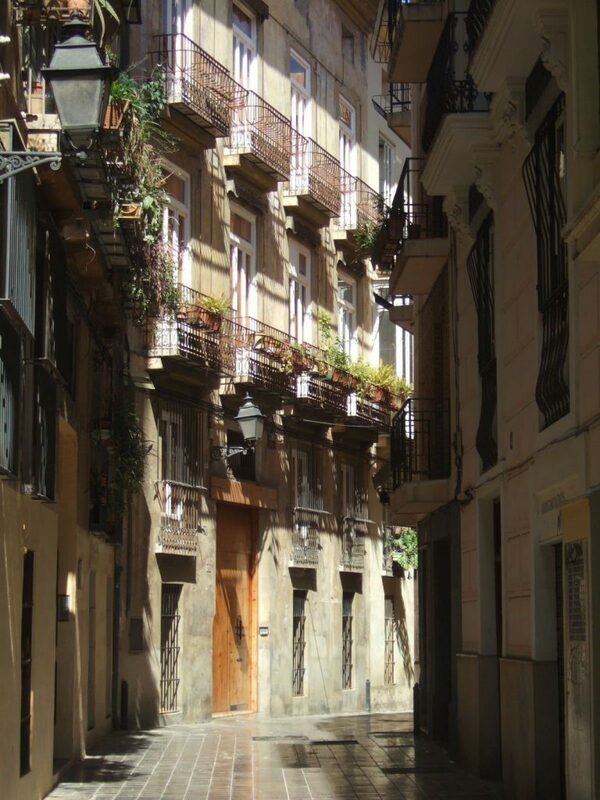 This 13th-century neighborhood is a historical gem with charming streets that are meant to get lost in. Keep your eyes open for Carrer Barraca and Carrer Progres, two streets that boast stunning tiled buildings with vibrant colors. If you love wine and gastronomy then head on over to Casa Montaña , serving of very affordable meals since 1836. 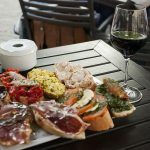 La Maceta is a cool and eclectic place serving up some interesting tapas that you won’t find anywhere else in Valencia. If you’d like to stay in one of Valencia’s greatest gems, NH Ciudad de Valencia is a price-friendly hotel with all of the amenities you need. It’s also a 15-minute walk to the City of Arts and Sciences. 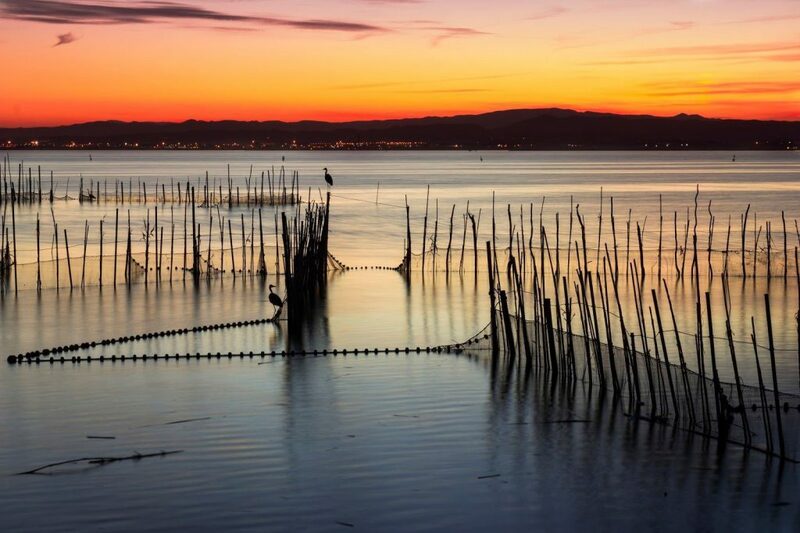 Meaning “lagoon,” Albufera is home to the largest lake in Spain and is home to a variety of wildlife, making it one of the most important wetlands in the country. For years, these waters produced fish and rice to the city, making it an important treasure to Valencia’s gastronomy. El Palmar is a nearby village where you can get a wonderful taste of the local duo. You’re going to find some impeccable rice dishes at both La Cambra dels Sentits and Mateu . If you’re traveling in style the Parador de El Saler is a luxurious option that offers a spa, one of the top 10 golf courses in Spain, and of course, the wildlife of the natural park. If that weren’t enough, the beach is just a quick 4-minute walk away. Hotel Albufera is a more modest choice and an excellent one at that if you prefer to have all the amenities you need at your fingertips. Located inside the Albufera Commercial Park, the hotel is conveniently located 5-6 kilometers of both the City of Arts and Sciences and the beaches. If you prefer to be closer to the natural park and have a homier stay, Aparthotel Albufera is a fantastic price-friendly option. It includes both an indoor and outdoor swimming pool and a gym. 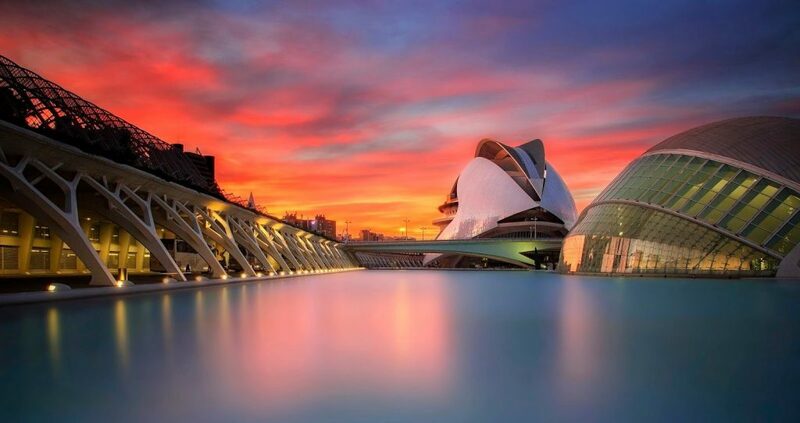 It’s no wonder that Valencia is one of the most popular holiday destinations in Spain. The magnificent city is the perfect choice for you travelers who love to experience a little bit of everything. Ancient history, modern museums, delectable cuisine, alluring city streets and an architectural wonderland make Valencia a Spanish destination you won’t want to miss!